Tony writes: The cooking mysteries that grip me tend to come from the good food memories of my youth. Occasionally, though, I will remember eating something so terrible that it causes me to wonder. Stuffed shells are one of those things. Not that they were ever as horrible as liver and onions, but the shells I ate as a kid were consistently bad no matter the cook or venue: pasta filled with an impossibly large glop of plain ricotta, swimming in a mess of jarred tomato sauce. And here’s the mystery: to this day, I’m still not sure why anybody couldn’t do better (or at least different). Stuffing things – pasta, chicken breasts, olives, pizza crusts, whatever – normally produces wonderful results. So why can’t stuffing work with a pairing as pleasant as pasta, cheese, and sauce? Following a recent middle-school flashback, I’ve become obsessed with getting stuffed shells right. A handful of attempts culminated in a dramatic breakthrough of a dinner, in which the shells fulfilled all the promise that pasta and cheese could ever hope for. So, I thought I would share my basic technique; maybe it will allow you, too, to get past the stuffed shell memories of your youth. 1. 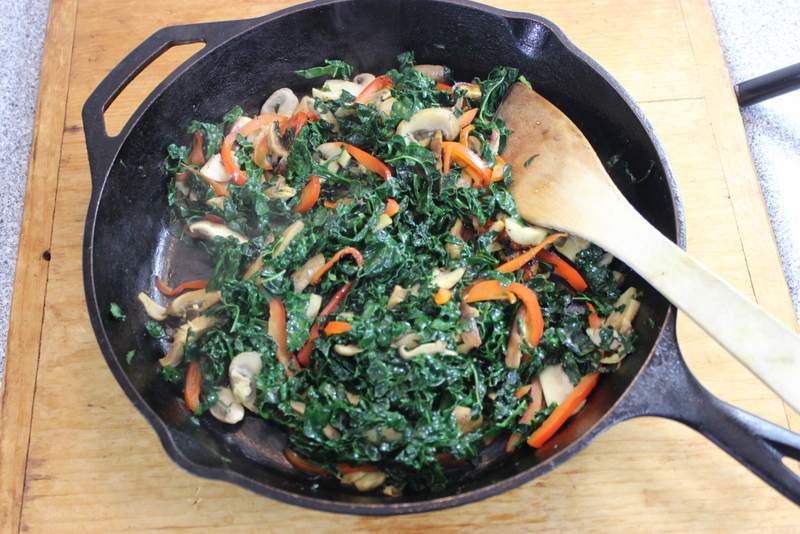 Make the mushroom-kale filling: Saute 1 garlic clove (smashed) with 2 Tbs. olive oil in large skillet over medium-high heat until the garlic sizzles steadily and becomes fragrant, about 2 minutes. Add 10 oz. mix thinly sliced mushrooms (shiitakes, oyster, and cremini), and 1/2 red bell pepper (thinly sliced) and sprinkle with 1 tsp. kosher salt. Cook, without touching, until the mushrooms start to brown, about 2 minutes. Cook, tossing, for another minute or so until the mushrooms just start to soften. Stir in 8 oz. chopped kale (the bagged stuff is fine), sprinkle with salt, and cook, tossing, until it just wilts, about 2 minutes. Remove from the heat and let cool to room temperature. Press out (and pour off) any excess moisture (to keep the mixture from becoming watery in the oven), discard the garlic cloves and mash with 1 lb. whole milk ricotta, 1 tsp. chopped fresh thyme, and salt and pepper to taste. 2. Make the sauce and boil the shells: Bring a large of salted water to a boil. 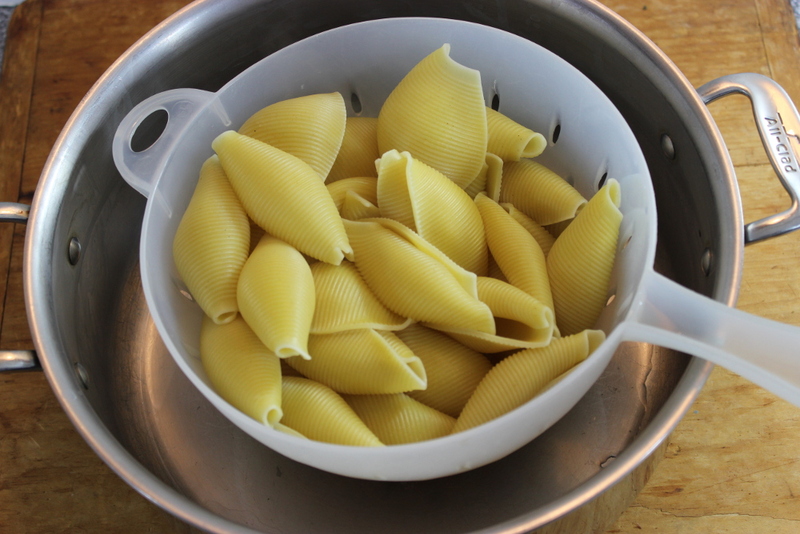 Cook 1 box pasta shells (12 oz; I like Barilla; good texture, durable, affordable) until tender but toothy, about 9 minutes. Strain and cool under running water. While the pasta is cooking, make a quick sauce. 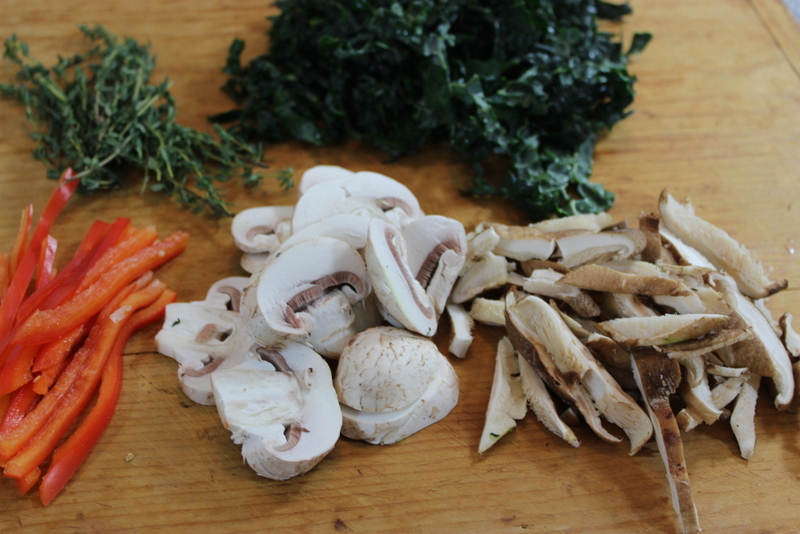 I like bolstering the earthiness of the mushrooms and kale with a meat sauce. To make the sauce, saute 2 garlic cloves (smashed) with 2 Tbs. olive oil in a Dutch oven over medium-high heat until the garlic sizzles steadily and becomes fragrant, about 2 minutes. Discard the garlic (it’s already done its flavoring thing) and add 1/2 tsp. crushed red pepper flakes and 1 lb. Italian sausage (removed from the casing) and cook, breaking up with a wooden spoon, until the sausage browns. Add a 28-oz can whole tomatoes (and their juices) and a sprinkling of whatever fresh herb you used for the ricotta filling (thyme?). Break up the tomatoes with a wooden spoon and bring the sauce to a boil. Reduce the sauce to a gentle simmer, cover and cook, stirring occasionally, until the sausage cooks through and enriches the sauce, about 30 minutes. Season generously with S+P to taste. 3. Assemble and bake: Heat the oven to 425F. 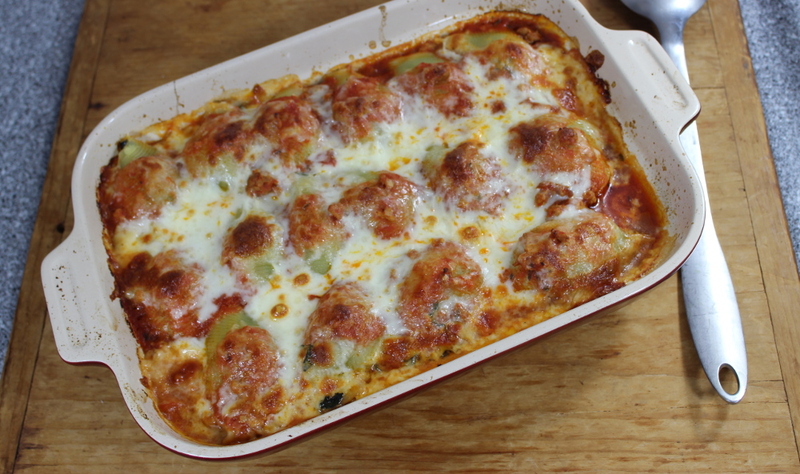 Grease a 9×13 baking dish and then spread an even layer of sauce on the bottom of the pan. Using a small spoon, fill the shells with the ricotta mixture; don’t overfill them – you should be able to fold the shells back over the cheese. 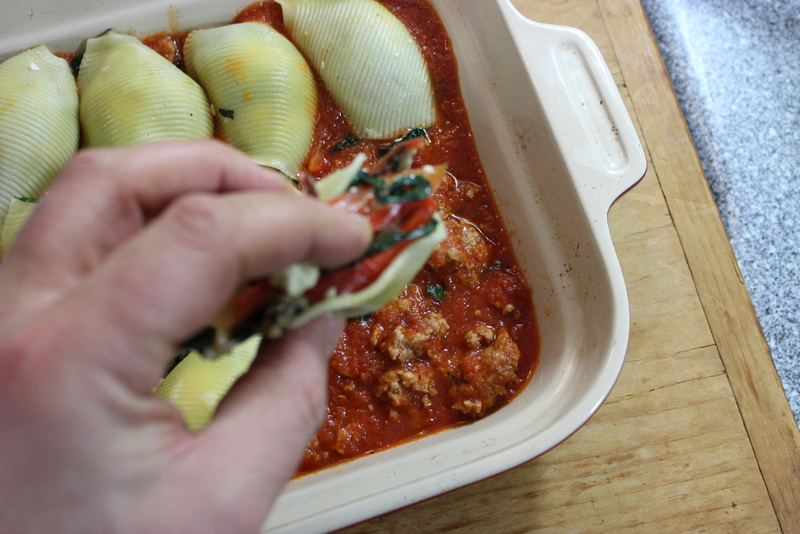 Set the stuffed shell in the baking dish and repeat with the remaining cheese and pasta; you’ll get about 1 1/2 layers. Top with the sauce, spreading it even and then top with some grated Parmigiano and some thin slices of fresh mozzarella. Note: you can do this assembly up to 2 days ahead. Bake the pasta until the shells and cheese brown and the filling and sauce bubble around the edges of the baking dish, 25 minutes. Serve with something green and enjoy.